It’s been a crazy busy week as I finished up design projects to ship to an editor. So tonight, after getting the projects blocking, I decided I deserved a little “play” crochet time. I’ve been wanting to experiment with the “love-knot” from Vashti’s class I took in Manchester this past summer. She had talked about how fun love knots are to work with beads for simple jewelry. I decided for my purposes I would use some of the Jelly Yarn “thread” or “super fine” and some iredescent E-beads I had on hand. 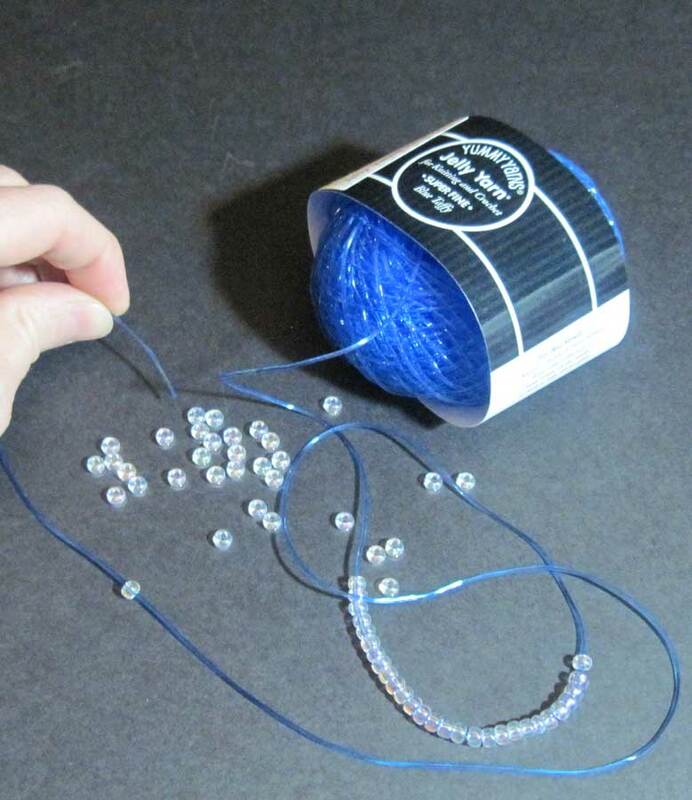 The best thing about Jelly Yarn for working with beads is you don’t need a needle to get the beads on the “yarn”. 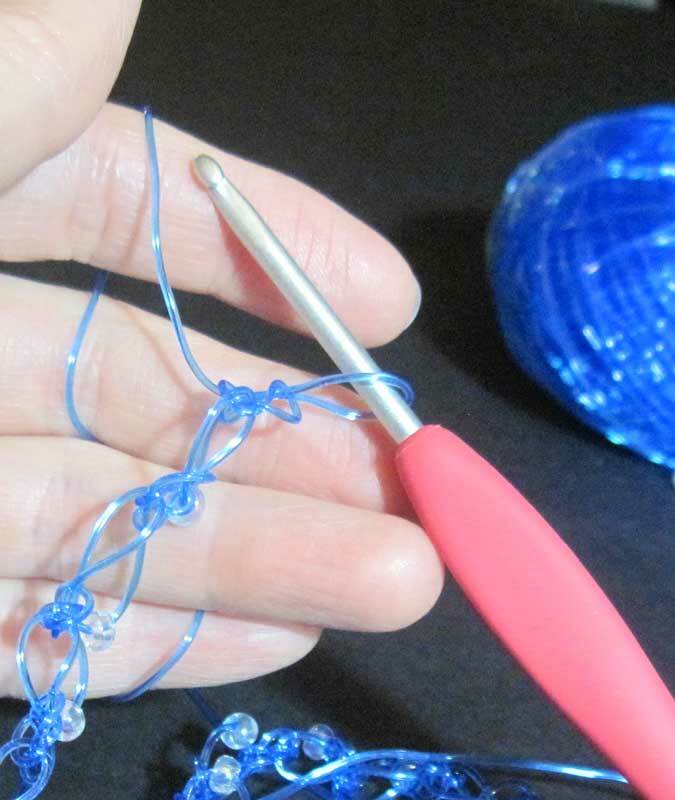 For this experiment I wanted to make the love knots about a half inch long, the springiness of the jelly yarn would cause them to open up nicely. 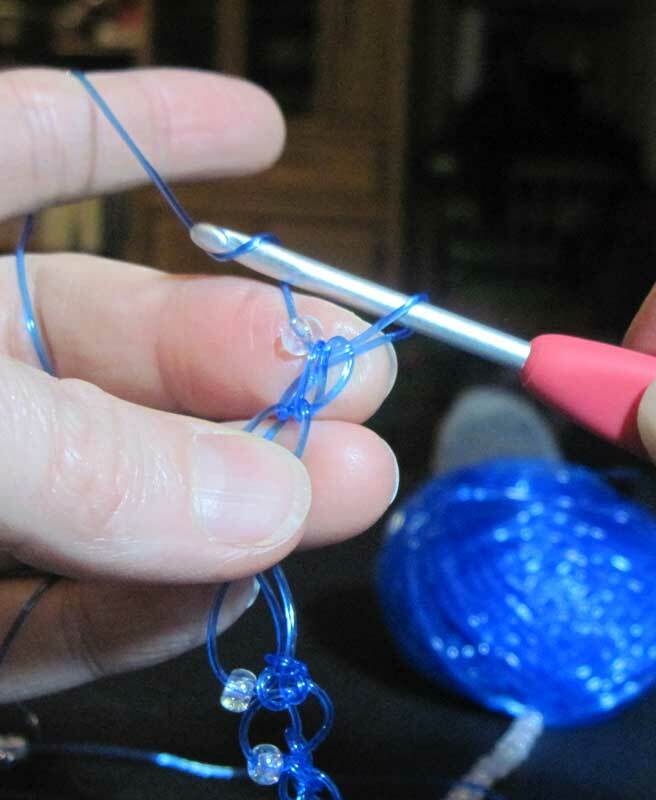 I started with a single crochet in my beginning chain, then I worked my love knots by pulling the loop on my hook up to 1/2 an inch long. 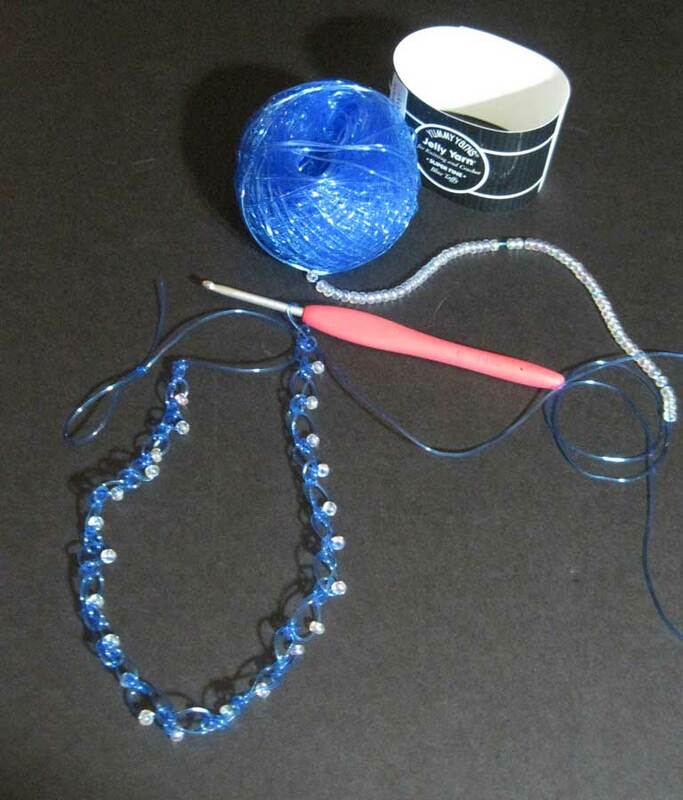 I slid one of the beads up to the base of my working yarn, then pulled thru a loop like making a chain. 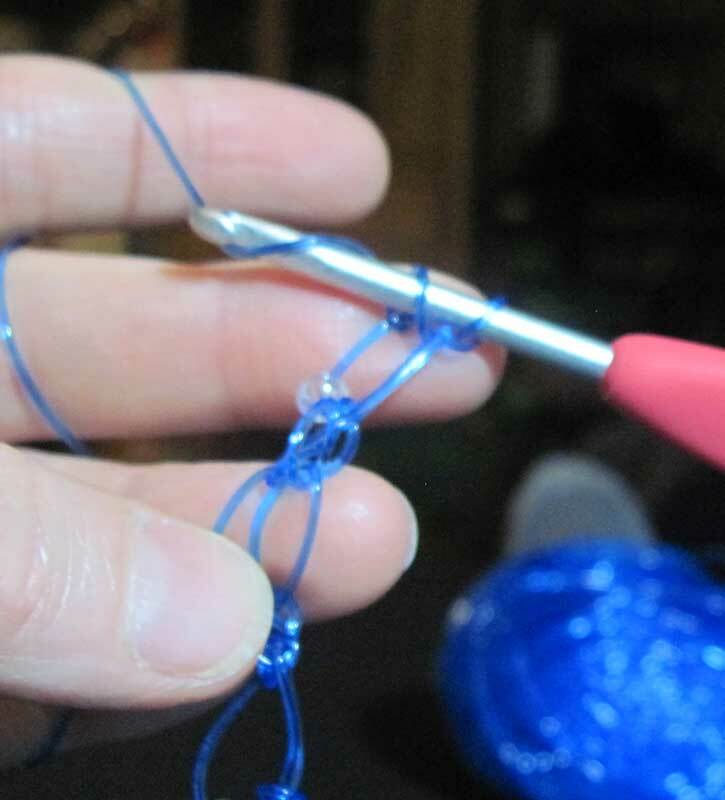 Then, I worked a sc in the back bump of the chain stitch as my “knot” sc. I repeated these steps for a while, and the photo above is what I came up with so far this evening. I’m not 100% sure if I like it enough to keep it. So I’ll look at it again tomorrow (or maybe in a few days) and decide. Time for a good night’s sleep now. Ooh! It’s very pretty! Where do you get jelly yarn? I’ve not seen it anywhere, though I’ve heard of it. Thanks! Now to learn the love knot! 🙂 love your posts. Have got to start posting more on my blog! This is beautiful. Do you think that this would work in wire? I think it would, but you would have to shape the loops a bit more. I’m also wondering how flexible it would be? Couldn’t hurt to try though if you have some wire on hand. Thanks Vashti, I had a lot of fun playing with it. The Jelly yarn is very sprongy, so the loops are really exaggerated. Now I just need a beach to wear it to. LOL!